During Denver Arts Week 2018, the Art District on Santa Fe (ADSF)—a nonprofit arts organization and Certified Creative District in Denver—is proud to introduce a Día de los Muertos celebration coinciding with the First Friday Art Walk on Friday, November 2, 2018. The event is a collaboration between ADSF, Consulate General de Mexico in Denver, Museo de las Americas, Su Teatro, Colorado Ballet, CHAC Gallery, the Office of Councilman Paul D. López, Univision Colorado, and FOX31 with news partner Colorado’s Own Channel 2. 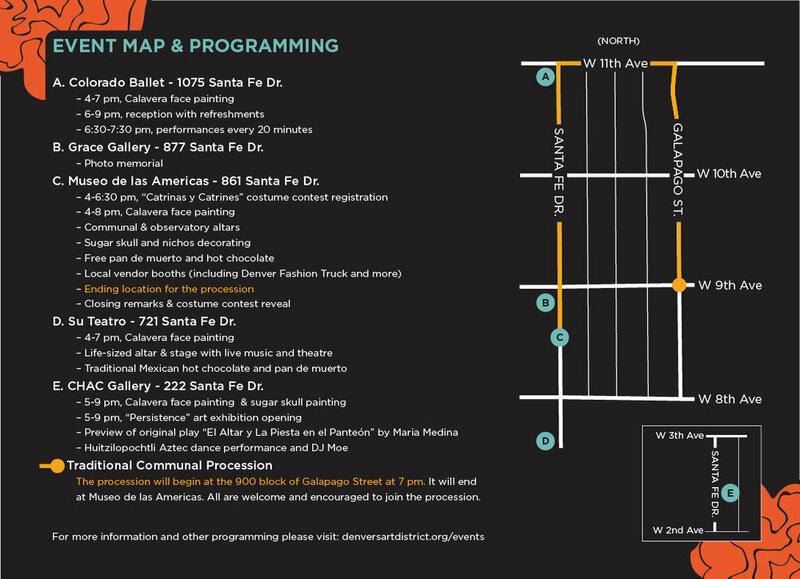 To commemorate, on Thursday, November 1, festivities kick off with a free screening of the film “Coco” hosted at Su Teatro Cultural & Performing Arts Center at 6:30 p.m.
On Friday, November 2, in addition to traditional First Friday Art Walk activities—with late-night access to hundreds of artists and exhibits among the galleries on Santa Fe Drive—there will also be Catrina face painting stations and community altars positioned throughout the district between CHAC Gallery and the Colorado Ballet. There will also be special performances at a variety of the large cultural institutions along the corridor. The public is also invited to take part in a community procession honoring loved ones on Friday, November 2. The procession will begin at the corner of 9th and Galapago at 7 p.m. The walking route will continue north to 11th Avenue, head west to Santa Fe Drive, then south on Santa Fe Drive, ending at Museo de las Americas. The procession will end at the back patio of Museo de las Americas, where there will be a communal altar. Also at Museo, a Catrina costume contest will be held along with a closing celebration.